Download CFI’s free P&L template and Excel file. Enter your own numbers and edit both the monthly and annual worksheets. 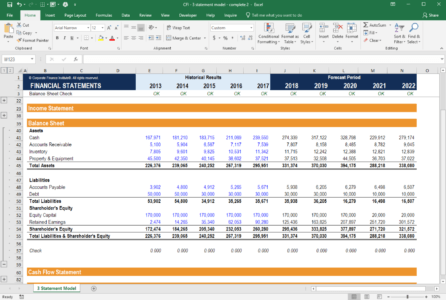 Explore and download the free Excel templates below to perform different kinds of financial calculations, build financial models and documents, and create professional charts and graphs. CFI’s financial model template library has hundreds of free Excel file downloads to help you become a world-class financial analyst. Balance Sheet This balance sheet template provides you with a foundation to build your own company's financial statement showing the total assets, liabilities and shareholders' equity. Income Statement This income statement template provides you with a foundation to build your own monthly or annual summary of revenues and expenses. Profit and Loss (P&L) Statement This profit and loss (P&L) statement template summarizes a company's income and expenses for a period of time to arrive at its net earnings for the period. Cash Flow Statement This cash flow statement template provides you with a foundation to record operating, investing and financing cash flows annually. DCF Model This DCF model template provides you with a foundation to build your own discounted cash flow model with different assumptions. Property Plant and Equipment Schedule This property plant and equipment (PP&E) schedule template will help you keep track of PP&E balances and depreciation costs. Bank Reconciliation Statement This bank reconciliation statement template shows you how to calculate the adjusted cash balance using the bank statement and a company's accounting record. 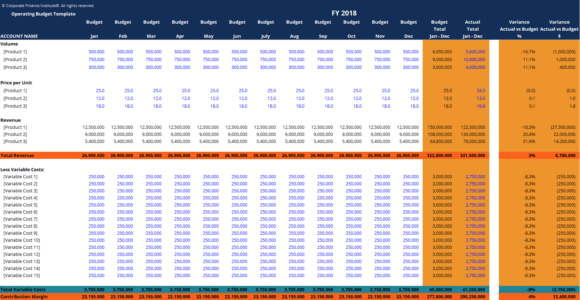 Operating Budget This operating budget template helps you prepare your monthly and annual revenue, costs and expenses budget. Project Budget This project budget template provides you with a tool to summarize the cost budget for a project. Cash Budget This cash budget template will help you plan your cash inflows and outflows on a monthly basis. Personal Financial Statement This personal financial statement template is a great tool to keep track your personal assets, liabilities, income and expenses. Consolidation Model This consolidation model template helps you summarize the financial performance of multiple business units into a consolidated model. Capitalization Table This capitalization table template is a helpful tool for a startup company or early-stage venture to list all the company’s securities. Cohort Analysis This cohort analysis template is a useful tool for customer behavior analysis using a large data set. 3 Statement Model This 3 statement financial model links the income statement, balance sheet & cash flow. Financial Projection Template This financial projection template will help you forecast future revenues and expenses by building up from payroll schedules, operating expenses schedules and sales forecast to the three financial statements. Debt Capacity Model This Debt Capacity Model Template will help you assess the debt capacity based on various credit metrics and current earnings. Personal Finance Budget This personal budget template will help you determine the state of your finances and help plan your monthly or annual spending. Capital Investment Model This capital investment model helps you calculate key valuation metrics of a capital investment including the cash flows, net present value (NPV), internal rate of return (IRR), and payback period. Financial Synergy Valuation Model This Financial Synergy Valuation Excel Model enables you – with the beta, pre-tax cost of debt, tax rate, debt to capital ratio, revenues, operating income (EBIT), pre-tax return on capital, reinvestment rate and length of growth period – to compute the value of the global synergy in a merger. Stable Growth vs 2 Stage Valuation Model This Stable Growth vs 2 Stage Valuation Model will help you determine firm value based on different growth assumptions for a business. Want some more advanced financial models? Get instant access to over 15 premium financial models in CFI’s Financial Modeling Templates Package. CFI’s premium package is designed for professionals working in private equity, financial planning & analysis (FP&A), equity research, treasury, corporate development, investment banking, accounting, consulting, and other functions that require modeling skills. CapEx Formula This CapEx formula template helps you calculate the amount of capital expenditures using numbers in the income statement and balance sheet. Cost of Goods Manufactured This cost of goods manufactured template lays out a schedule of COGM using the amount of direct materials, direct labor, manufacturing overhead and work in process inventory. CAPM Formula This CAPM formula template will help you calculate the required rate of return for investing in a security given the risk-free return and risk premium. Equity Beta Asset Beta Conversion This equity beta asset beta conversion template allows you to convert between equity beta and asset beta. Market to Book (Price to Book) Ratio This market to book ratio template allows you to calculate the Market/Book ratio using the market capitalization and the net book value. Discount Factor This discount factor template helps you calculate the amount of discounted cash flows using explicit discount factors. Return on Investment Calculator This return on investment calculator will show you how to calculate ROI using four different approaches. Market Value of Debt This market value of debt template shows you how to calculate the market value of debt given the FV of total debt, interest expense, cost of debt and weighted average maturity. Leverage Ratios This leverage ratios template helps you calculate five commonly used leverage ratios. Enterprise Value vs Equity Value Calculator This enterprise value vs equity value calculator will allow you to compare the equity value of two companies with the same enterprise value but different capital structures. Sensitivity Analysis Table This sensitivity analysis table template helps you predict sales revenue based on changes in input variables including traffic growth, unit price and sales volume. EBITDA Multiple This EBITDA multiple template helps you find out the EBITDA multiple given the line items for determining the enterprise value. WACC Calculator This WACC calculator helps you calculate WACC based on capital structure, cost of equity, cost of debt and tax rate. Cash Flow Reconciliation This cash flow reconciliation template will help you differentiate between EBITDA, CF, FCF and FCFF. Effective Annual Interest Rate Calculator This effective annual interest rate calculator helps you calculate the EAR given the nominal interest rate and number of compounding periods. Tax Shield Example This tax shield example template shows how interest tax shield and depreciated tax shield are calculated. Accounting Rate of Return This accounting rate of return template will demonstrate two examples of ARR calculation. Return on Assets This return on assets template will help you calculate return on assets using net income and the amount of start of period and end of period assets. EV/EBITDA This EV/EBITDA template guides you through the calculation of EV/EBITDA using figures from an Income Statement. Earnings Per Share This earnings per share template helps you calculate basic and diluted EPS given information on common and preferred shares. EBITDA Margin This EBITDA margin template shows you how to calculate EBITDA margin using revenue amounts and EBITDA. Economic Value Added This economic value added template guides you to compute EVA using the amount of capital invested, WACC and NOPLAT. Market Risk Premium This market risk premium template will show you how to compute the market risk premium using the expected rate of return and risk-free rate. Perpetuity Calculator This perpetuity calculator shows you how to compute present value of perpetuity and perpetuity with growth. EBIT vs EBITDA This EBIT vs EBITDA template will help you distinguish between EBIT and EBITDA calculations. XIRR vs IRR This XIRR vs IRR template allows you to differentiate between the use of IRR and XIRR functions to compute the internal rate of return. Debt Equity Ratio This debt equity ratio template shows you how to calculate D/E ratio given the amounts of short-term and long-term debt and shareholder's equity. Quick Ratio This quick ratio template helps you calculate the quick ratio given the amount of cash, marketable securities, accounts receivable and accounts payable. Diluted EPS Formula This diluted EPS formula template shows you how to compute the diluted earnings per share using information from income statement and an employee option schedule. Margin of Safety This margin of safety template will allow you to calculate the margin of safety given the profits and break-even point. Exchange Ratio This exchange ratio template shows you how to calculate an exchange ratio using the offer price for the target's shares and the acquirer's share price. Comparable Company Analysis This comparable company analysis template demonstrates how to compute and compare valuation ratios of industry competitors. Present Value of Growth Opportunities This present value of growth opportunities template shows you how to calculate the PVGO given the market price of stock, required rate of return and expected earnings. Expected Return This expected return template will demonstrate the calculation of expected return for a single investment and for a portfolio. Adjusted Present Value This adjusted present value template guides you through the calculation of APV starting with the value of unlevered project and PV of debt financing. Markup Calculator This markup calculator shows you how to compute the markup amount and percentage given the selling price and cost of purchase. Crossover Rate This crossover rate template will demonstrate how to calculate the NPV of different projects and plot the NPV profiles to identify the crossover rate. Cost of Preferred Stock Calculator This cost of preferred stock calculator shows you how to calculate the cost of preferred stock given the dividend, stock price and growth rate. Salvage Value This salvage value template shows the calculation of salvage value of an equipment. 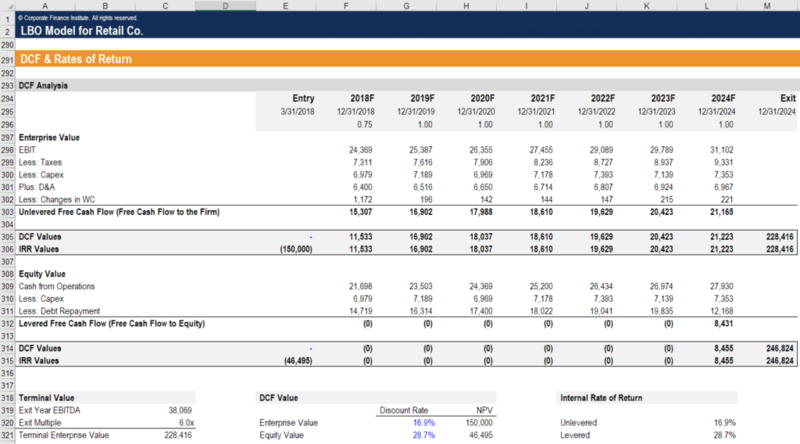 Unlevered FCF This unlevered FCF template will show you how to compute the unlevered free cash flows with EBIT, tax, depreciation & amortization, change in NWC and Capex. Sharpe Ratio Calculator This sharpe ratio calculator template demonstrates the calculation of sharpe ratio to determine an investment's performance relative to risk. Target Costing This target costing template shows you how to find the target cost given the selling price and profit margin. Operating Income This operating income template shows you how to calculate operating income using line items from the income statement. Straight Line Depreciation This straight line depreciation template demonstrates how to calculate depreciation expense using the straight line depreciation method. Weighted Average Shares Outstanding This weighted average shares outstanding template shows you how to calculate the weighted average shares outstanding using quarterly data. Cost of Goods Sold This cost of goods sold template demonstrates three methods of COGS accounting: FIFO, LIFO and weighted average. Fixed Asset Turnover This fixed asset turnover template teaches you how to calculate the fixed asset turnover ratio using the formula: Fixed Asset Turnover = Net Sales / Average Fixed Assets. Unlevered Cost of Capital This unlevered cost of capital template shows you how to compute the unlevered cost of capital given the risk free rate, unlevered beta and expected market return. Variance Formula This variance formula template helps you find out the variance between actual and forecast financial figures. Variance Analysis This variance analysis template guides you through the process of variance analysis using the column method. NOPAT This NOPAT template shows you how to calculate the net operating profit after tax using the income statement. Forward P/E Ratio This forward P/E ratio template helps you find out the forward P/E ratio given the share price and earnings per share of stocks. Economic Order Quantity This economic order quantity template helps you identify the optimal order quantity which minimizes the cost of ordering and holding inventory. Geometric Mean This geometric mean template helps you compare investment options by calculating the final value of investments using geometric mean. Payback Period This payback period template will help you visualize and determine the period of time a company takes to recoup its investment. Net Income This net income template shows you the calculation of net income using line items from an income statement. 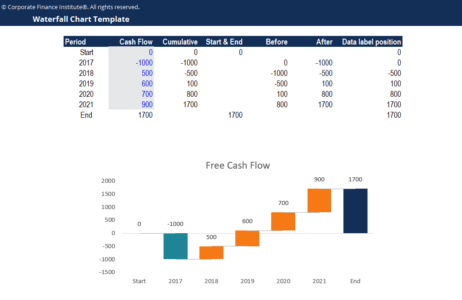 Free Cash Flow This free cash flow template shows you how to calculate free cash flow using a cash flow statement. Equity Risk Premium This equity risk premium template shows you how to calculate equity risk premium given the risk-free rate, beta of stock and expected return on the market. Days Sales Outstanding This days sales outstanding template demonstrates the calculation of the number of days it takes to collect all accounts receivable. Capital Gains Yield Calculator This capital gains yield calculator demonstrates how to calculate the capital gains yield using the purchase price and current price of a stock. Contribution Analysis This contribution analysis template helps you calculate the total and per unit contribution margin. Net Identifiable Assets This net identifiable assets template will show you how to calculate the net identifiable assets given the value of assets and liabilities of an acquired company. Earnings Before Tax This earnings before tax template shows you how to calculate the earnings before tax using line items in the income statement. Leveraged Finance This leveraged finance template shows the calculation of internal rate of return of an investment with different levels of leverage. LTM Revenue This LTM revenue template demonstrates the calculation of last-twelve-month revenue. Sharpe Ratio Table This sharpe ratio table template demonstrates the calculation of sharpe ratio given the expected portfolio return, risk-free rate and standard deviation of the portfolio return. Earnings Before Interest & Taxes This earnings before interest & taxes template helps you calculate enterprise value, EBIT and the EV/EBIT ratio. Cost Behavior Analysis This cost behavior analysis template shows you how a cost changes with changes in the level of activity relating to that cost. Revenue Variance Analysis This revenue variance analysis template demonstrates how to use the column-based approach to calculate the three different types of revenue variance. Proforma Earnings Per Share This proforma earnings per share template shows you how to calculate the earnings per share assuming a merger and acquisition takes place. Price/Earnings to Growth Ratio Template This price/earnings to growth ratio template shows you the calculation of PEG ratio given the share price, EPS and EPS growth rate. Contribution Margin Ratio This contribution margin ratio template shows you how to calculate the contribution margin, CM percentage and breakeven point. Days Sales in Inventory This days sales in inventory template will show you how to find average number of days or time required for a business to convert its inventory into sales. Liquidation Value This liquidation value template helps you compute the liquidation value given a company's total liabilities and assets in auction value. Additional Paid in Capital This additional paid in capital template demonstrates the calculation of additional amount of capital paid by investors. Burn Rate This burn rate template demonstrates how to calculate the gross and net burn rate of cash of a company earning negative profit. Working Capital Cycle This working capital cycle template shows you how to calculate the working capital cycle given the inventory days, receivable days and payable days. Market Capitalization This market capitalization template helps you differentiate between market capitalization and enterprise value. Revenue Run Rate This revenue run rate template shows you how to calculate the annualized revenue. Adjusted EBITDA This adjusted EBITDA template will guide you through the calculation of adjusted EBITDA by removing any one-time items from EBITDA. CVP Analysis This CVP analysis template helps you perform a break-even analysis, calculate margin of safety and find the degree of operating leverage. Sales Tax Decalculator This sales tax decalculator template will help you calculate the pre-tax price of a good or service when the total price and tax rate are known. Intrinsic Value This intrinsic value template will demonstrate the calculation of intrinsic value using the discount rate method and certainty factor method. Dilution This dilution template helps you identify the impact of dilutive securities on the share price. Depreciation Methods This depreciation methods template will show you the calculation of depreciation expenses using four types of commonly use depreciation methods. Net Present Value This net present value template helps you calculate net present value given the discount rate and undiscounted cash flows. Marginal Cost of Production This marginal cost of production template will show you how to calculate different types of marginal costs. Debt to Asset Ratio This debt to asset ratio template will show how to calculate the Debt/Asset ratio given the amount of assets, short-term and long-term debt. Beta Calculator This beta calculator allows you to measure the volatility of returns of an individual stock relative to the entire market. Cost of Equity Calculator This cost of equity calculator helps you calculate the cost of equity given the risk free rate, beta and equity risk premium. 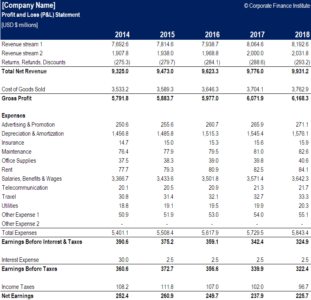 Common Size Analysis This common size analysis template allows you to compare the financial performance of companies in different sizes on the same scale. Effective Annual Rate Calculator This effective annual rate calculator will help you compute the effect annual rate given the nominal interest rate and the number of compounding periods. Profit Margin This profit margin template will allow you to calculate the gross profit, EBITDA, and net profit margins. ROIC Calculator This ROIC Excel Template will aid you in calculating the NOPAT and Book Value of Invested Capital, and from these elements calculate the period ROIC. ROI Calculator This Return on Investment Excel Calculator will aid you in calculating the Return on investment for different scenarios. Coupon Rate Calculator This coupon rate template will calculate a bonds coupon rate based on the total annual coupon payments and the face value of the bond. Profitability Index Template This Profitability Index template will help visualize the Present Value of future cash flows which will then be used to calculate the PI of the project. LTV/CAC Ratio Template This LTV/CAC Ratio Template will help calculate both the LTV and CAC of a company's user base. These will then be used to obtain the LTV/CAC Ratio. Marginal Revenue Calculator This Marginal Revenue Calculator will aid you in calculating the marginal revenue given the units of production of two consecutive periods. Activity-Based Costing Calculator This Activity-based costing calculator template is a great tool to break-down overhead costs through Activity Based Costing. Alpha Calculator This Alpha Calculator will compute the value of Alpha based on the Capital Asset Pricing Model. Interest Rate Calculator This interest Rate Calculator will help you compute the effective interest rate based on the number of periods, type of interest rate (simple vs compound), and initial balance amount. EV to Revenue Multiple This Enterprise Value (EV) to Revenue Multiple Calculator will aid in determining the Enterprise Value based on both the Equity Value and Debt Value, from the EV it will then calculate the EV to Revenue multiple. Current Ratio Calculator This Current Ratio Calculator will help you calculate the current ratio given the sum of all current assets and current liabilities. DPS Calculator This Dividend Per Share (DPS) Calculator template will help you calculate the total amount of dividend attributed to each individual share outstanding of a company. Gross Profit Calculator This Gross Profit Calculator will help you visualize how to achieve the Gross Profit value on the Income Statement. Product Costs This Product Costs Template will help break down the Product Costs into the costs of Direct Material (DM), Direct Labour and Manufacturing Overhead (MOH). Debt Service Coverage Ratio This debt service coverage ratio template will help you calculate the debt service coverage ratio by both including and excluding Capex. FCFF vs FCFE Reconciliation This FCFF vs FCFE Reconciliation Template allows you to reconcile Free Cash Flow to Fim (FCFF) vs Free Cash Flow to Equity (FCFE). Year over Year Analysis (YoY) This Year over Year Analysis (YoY) template demonstrates how to perform a YoY analysis using financial data. EBITDA This EBITDA template will show you how to calculate EBITDA using the income statement and cash flow statement. Justified Price-to-Earnings Ratio This Justified P/E Ratio template will allow you to calculate and compare justified price-to-earnings ratio and the standard price-to-earnings ratio in Excel. P/E Ratio This P/E ratio template will show you how to calculate the Price-to-Earnings multiple using share price and earnings per share. Net Profit Margin This Net Profit Margin template will show you how to calculate the net profit margin using a company's income statement line items. ROCE Template This Return on Capital Employed (ROCE) template will help you calculate the profitability ratio used to measure how efficiently a company is using its capital. Interest Coverage Ratio This Interest Coverage Ratio template will guide you through the calculation of interest coverage ratio using an income statement. Net Debt/EBITDA Ratio This Net Debt/EBITDA Ratio template will show how to calculate the interest coverage ratio using the formula: (Short Term Debt + Long Term Debt - Cash and Cash Equivalent) / EBITDA. Operating Cash Flow Ratio This Operating Cash Flow Ratio template will show you how to calculate the operating cash flow ratio, deriving from the formula: operating cash flow divided by current liabilities. Year to Date (YTD) Template This Year to Date (YTD) template will guide you on how to calculate the year to date return on a portfolio or a stock for different end dates. Days Inventory Outstanding This Days Inventory Outstanding Template will show you how to arrive at the number of days inventory outstanding using the formula: Average Annual Inventory / Cost of Sales x # of Days in Period. Cash Conversion Ratio This Cash Conversion Ratio Template will demonstrate how to calculate the cash conversion rate using the income statement and cash flow statement. Dividend Coverage Ratio This Dividend Coverage Ratio Template will show you the calculation for dividend coverage ratios for common shareholders and preferred shareholders. Accounts Payable Turnover Ratio This Accounts Payable Turnover Ratio Template will show you how to calculate payable turnover ratio and payable turnover in days. Accounts Receivable Turnover Ratio This Accounts Receivable Turnover Ratio Template will show you how to calculate receivable turnover ratio and receivable turnover in days. Cash Ratio This Cash Ratio Template will show you how to calculate the cash ratio which measures a company’s ability to pay off short-term debt obligations with cash and cash equivalents. Fixed Charge Coverage Ratio This Fixed Charge Coverage Ratio Template will show you how to compute the fixed charge coverage ratio using annual expenses and EBIT figures. Acid Test Ratio This Acid Test Ratio Template will show you how to calculate the acid test ratio the formula: (Current Assets - Inventory) / Current Liabilities. Dividend Payout Ratio This Dividend Payout Ratio Template will show you how to calculate the dividend payout ratio using the formula: DPR = Total dividends / Net income. Present Value Calculator This Present Value Calculator will help you compute the correct present value for an annuity or future investment. T-Accounts This T-Accounts Template will help you grasp how to use T-Accounts to track transactions. Cost of Debt Calculator This cost of debt calculator will help you use Excel to find the cost of debt using information from a company's issued debt. Journal Entries Guide This journal entries guide will help you learn the structure of a general ledger and enter journal entries yourself. Inventory Turnover Calculator This inventory turnover calculator can be used to compute both an inventory turnover ratio and inventory days from an income statement and balance sheet. 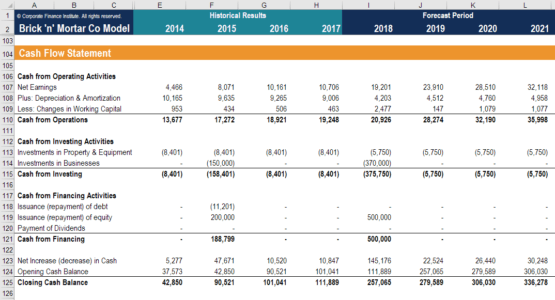 Double Declining Balance Depreciation Template This double declining balance depreciation template will help you find depreciation expense using one of the most common depreciation methods. FIFO Inventory Value Calculator This First-In-First-Out inventory value calculator will help you determine the cost of goods sold and the remaining inventory value after an amount of sales based on the FIFO method. LIFO Inventory Value Calculator This Last-In-First-Out inventory value calculator will help you determine the cost of goods sold and the remaining inventory value after an amount of sales based on the LIFO method. Pre Money Post Money Valuation Analysis Template This Pre Money Post Money Valuation Analysis Template will help you calculate the post money valuation of a company undergoing a Series X funding round. 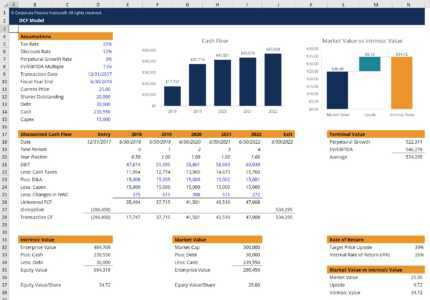 Equity Template This Equity Template will allow you to calculate a company's book value and market value of equity using the accounting method and financial analysis method. Charts and Graphs Template This charts and graphs template provides you with 10 different types of charts and graphs used in financial planning and analysis. Efficient Frontier and CAL This efficient frontier and CAL template demonstrates how to construct a portfolio frontier and CAL line chart to find the optimal portfolio. Waterfall Chart This waterfall chart template guides you step-by-step to construct a waterfall chart using raw data. Football Field Chart This football field chart template can be used to summarize a range of values for a business, based on different valuation methods. Gantt Chart This Gantt chart template will help you build a project schedule using a bar chart. Bullet Chart This bullet chart template teaches you how to create a bullet chart from scratch to compare actual versus forecasted performance. Bloomberg Functions This Excel spreadsheet contains a list of some of the most common and important functions, keystrokes and shortcuts to know on the Bloomberg Terminal. Excel for Finance Functions This Excel template demonstrates sample calculations using the top 10 most important functions and formulas for finance professionals. Sheet Name Code This sheet name code template allows you to display the name of an Excel sheet in a cell using a combination of formulas. Looking for more advanced models? Download over 15 premium financial model templates in CFI’s Financial Modeling Templates Package. The library package includes a wide range of advanced spreadsheets that will help you accelerate your career in investment banking, equity research, corporate development, private equity, financial planning & analysis (FP&A) and other areas of corporate finance. Thank you for browsing CFI’s free resource library! To continue learning and advancing your career as a financial analyst these additional resources will be helpful for you.